The annual rate of students who will enroll in online tutoring services worldwide is expected to double over the next few years. 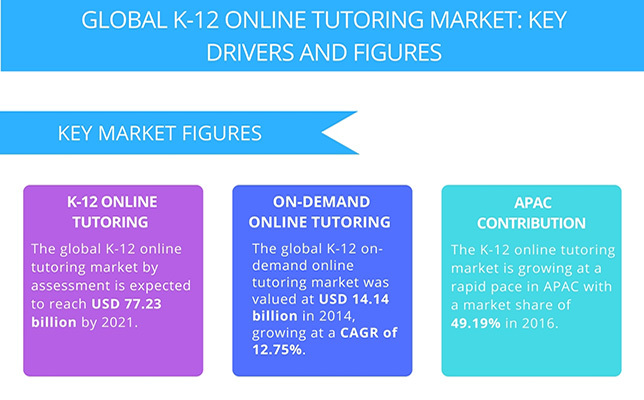 The global K-12 online tutoring market is projected to grow at a compound annual growth rate (CAGR) of 12.75 percent from 2017-2021, up from a CAGR of about 6 percent from 2016-2020, according to a recent report from Technavio. The K–12 segment of the online tutoring market was valued at $63.57 billion in 2016 and is forecasted to be $120.67 billion by 2021. Increasing customization of tutoring services. With virtual classrooms on the rise worldwide, the adoption of web conferencing tools like Google Hangouts, Syncpad and Skype are increasing in use. Additionally, apps like WizIQ Virtual Classroom Application and Eduwizards that provide collaboration tools for virtual classrooms are expected to penetrate the market. The report also highlights the rise of m-learning methods capable of providing real-time feedback and data. A range of apps provide students flexibility with on-demand individual instruction and support from expert online tutors. Key vendors include Fleet Education Services, Pearson Education and Skooli. Finally, analytical applications that create customized learning content and paths for individual students was identified as a major trend to drive market growth. Services like Kaplan, for example, offer online customization tools for students enrolled in exam preparatory courses that can help track their performance. To request a sample of the report, visit the Technavio site here (registration required).